When alcoholic drinks are off the menu, you need some delicious alternatives! Thirst-quenching, perfect for all ages and a whole lot healthier than the grown-up versions, make sure that you have a selection of these non-alcoholic recipes on offer at your party. An ideal concoction for the body-conscious guest. Simply pour all the ingredients into a shaker, mix with ice and shake well to let ingredients combine well. Strain into a glass and serve. Serve in the summer months as a refreshing treat. Pout the apple, pear and lemon juice into a shaker. Grate the ginger root to release the flavour. Put the ingredients into a glass and top up the mixture with the ginger ale. Stir and garnish with some grated ginger root. The alcoholic version has a strong kick. This alternative is all sweetness and light. Dice the lime, lemon and orange into small pieces. Place the pieces in the bottom of a glass. Add a sugar cube to the mix and plenty of crushed ice. Top the glass with the ginger ale and garnish with a sprig of mint after some stirring the mixture thoroughly. Bring a bit of Caribbean flavour to your home - without the rum! Peel the banana and place in a blender with the juice and coconut milk. Add in some ice and blend for 10 seconds. 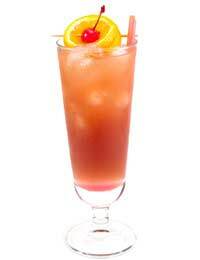 Pour in a large glass and serve with a straw with a garnish of sliced pineapple on the rim. The pretty colour of this low fat cocktail is reason enough to prepare it. Add to the mix the fact that it is packed with antioxidants and is fairly low in calories and you have a winner! Combine all the ingredients in a blender and blend until smooth and lilac in colour. Add water or more juice if you want a thinner consistency. Pour into a glass and garnish with one or two berries on top. Not for the faint-hearted, this is a famous hangover cure and a drink in its own right: worth trying at least once! Rinse a glass with the olive oil and discard the excess. Add the ketchup and the egg yolk before seasoning the Worcestershire sauce and white wine vinegar with the salt and pepper. Then its time to close your eyes and send it down the hatch!